I booked a flight to Dominican from Stockholm. They changed my flight to a day earlier and forced me to spend the night in Madrid. I said Ok, as long as I get compensated with a hotel. I called customer service 3-4 times to make sure they put a voucher in my file. After the 4th time they did. I called again to ask them to BOOK a hotel for me because I had a feeling all hotels would be booked (it was Dec. 23rd). They said, don't worry it will be fine, we will have a hotel for you. I get to Madrid at midnight, 4 hours late. Spanair manager's send all 10 of us to our hotel. The shuttle to the hotel arrives and says "your stupid airline didn't check with the hotel, but its full... sorry." All 10 of us go back up to the Spanair desk. No one is there. All 10 of us sleep on the floor. At 5am I am up to meed the Spainair manager from the night before. Although I am tired and super annoyed, he says he is sorry and then forces me to fill in a complaint form, a form that, as of yet, no one at Spanair has ever contacted me about. So, although we had not slept and were desperate to get to a hotel, they make us take 10 extra minutes to fill out this stupid form. The Spanair manager assures us he will get us to a hotel. He tells us to wait 5 minutes and then passes us off to some desk clerk (who was already swamped with screaming customers) because his shift has ended. 5 minutes turns into 3 hours! Even though its 8 a.m we continue to insist that we want a hotel because our flight to Dominican is only at 3 p.m. The girl behind the counter continues to call the hotel booking center. When she is on the phone, she assumes I don't speak any Spanish (which I do) and bad talks me in front of my face. As we continue to wait another hour. 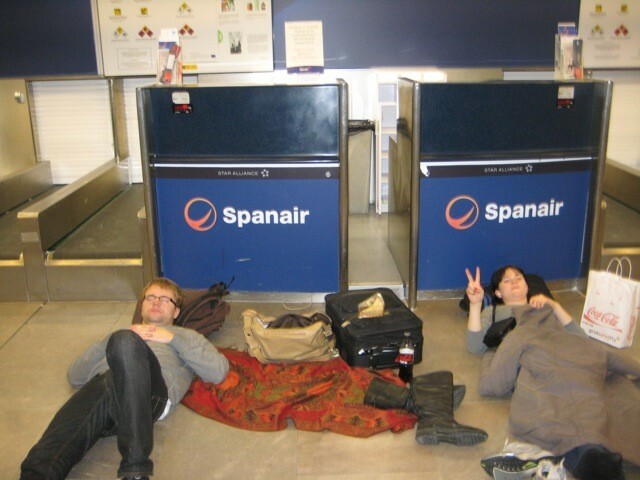 I decide to ask Spanair business lounge if we can wait there. I have done this before with other airlines. As long as your dressed nicely they usually are quite accommodating. The girl at the business lounge counter laughs at me. Literally! And says NO WAY. The girl who was called for our hotel, finally tells us the shuttle is coming. We wait outside for 30 minutes. It doesn't come. She calls it again (rolling her eyes at us every time we ask). We wait another 20 minutes, the bus drives right by us. She calls it again. It finally picks us at 9: 30 a.m, 4 1/2 hours after the Spanair manager "passed the buck" to the busy girl behind the desk. I have never, ever had such a horrible experience. Not least that they screwed up the hotel reservation. But that they were rude and irresponsible the whole way along. No one ever took responsibility for us. We contact you regarding your letter you send us concerning the reservation you made with Spanair. Regarding your claim and after have been requested information to the departure airport, we have been informed that they offered you an hotel voucher. We wish to have the pleasure of welcoming you on board again in the near future, and we trust that your next flight with Spanair will fully live up to your expectations. I wrote to them explaining my experience. No one has ever replied. Horrible airline. I will never fly with them again!